The flipped classroom is an approach to learning that flips the traditional “classroom lecture with practice at home” on its ear, by building knowledge before the classroom sessions even start. This enables participants to come to class ready to practice and apply what they’ve learned. Participants are more engaged in the classroom, collaborating and even learning from one another rather than devoting that time to one-directional lecture. Participants internalize the information faster and truly retain the skills at hand. Shared knowledge base: The students all begin with the same background knowledge thanks to pre-work assigned before the class begins. This tactic lessens the time needed to bring everyone up to speed on crucial content and allows more time to focus on learning, group problem solving and applying new skills. Learner-centered approach: The student is forced to become a coach to themselves, as well as others in a flipped classroom setting. In addition to promoting cohesiveness among the group, the learner is encouraged to teach themselves with limited instruction. This tactic makes it easier to take their new skills and apply them on the job. Sharing skill sets: When people with different jobs and responsibilities are brought together and asked to problem solve, it’s truly a recipe for success. With so many different skill sets in the room, each individual inevitably learns something of value from the other. In this setting, the group is able to build relationships, network, communicate, and learn how to solve problems as a team. The structure makes the learning more sustainable in the real world and back on the job. 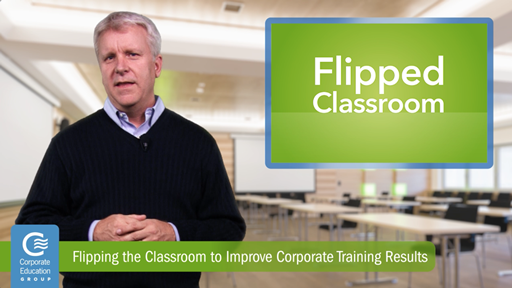 The flipped classroom is a tried-and-true approach that can be very beneficial in certain corporate situations. Its unique methodology makes it easier for participants to apply newly learned skills in the real world, as well as encouraging collaboration to solve problems.